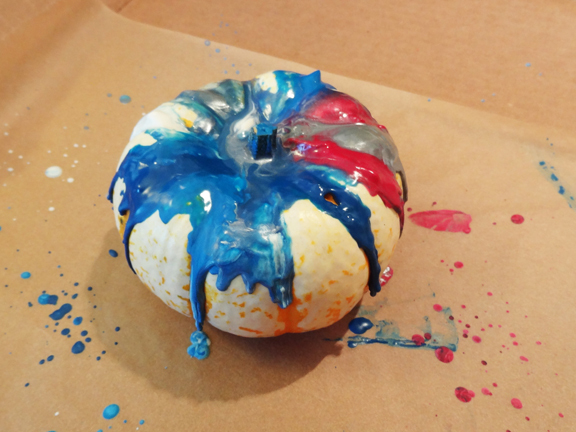 Pumpkin decorating with melted crayons is a super cool way to combine art and science while preparing your Halloween decorations. Plus, the end result is a beautifully decorated pumpkin! 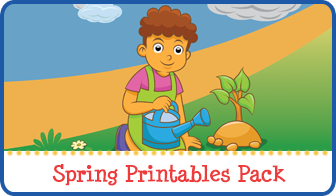 Note: For more fun-filled Halloween activities, see my Halloween Activities for Kids page. The kids started by peeling the paper off the crayons. They didn’t realize it, but they were getting a very good fine motor workout while doing this! Then the kids selected several crayons to place on top of their pumpkins. We put down our protective covering and turned on the hairdryer. At this point, the crayons promptly blew off the pumpkin, so we replaced them and adjusted the settings on our hairdryer. It was just a few seconds later that the crayons began to melt. And as you can see in the picture below, the wax splattered some as well, so definitely make sure you do a good job of protecting the area around your creation to avoid a big mess! And the end result was gorgeous! Note that the melted wax was brittle and broke easily, so take care when moving your pumpkin to its display spot. Oh! This looks like a fun project! 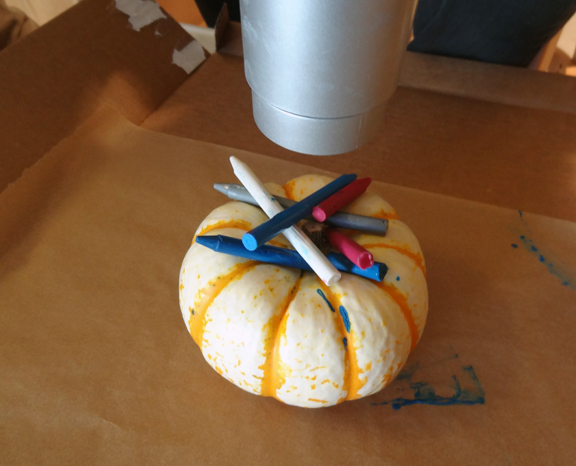 I always hated carving pumpkins because they get squishy and mold quickly! I can’t wait to try this out, thanks for the idea and instructions! Looks like it was fun. I’ve always wanted to try it, but I can’t deal with unwrapping all those crayons! This is so creative! I’m thinking this would be a great way to use all those restaurant crayon packs I have stashed away. lol Did you find that the heat damaged the pumpkin in any way? I didn’t find the heat to make a measurable difference in how quickly the pumpkin rotted. 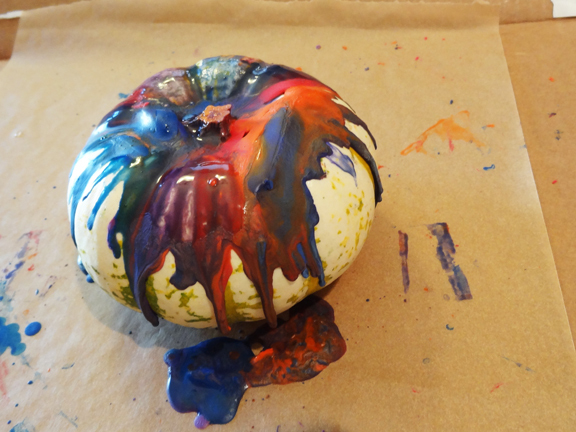 Fortunately the crayons we had melted so quickly we didn’t have to keep the heat on the pumpkins for very long. We did this last year– so fun and they turned out beautiful!! Your pumpkins turned out awesome!! 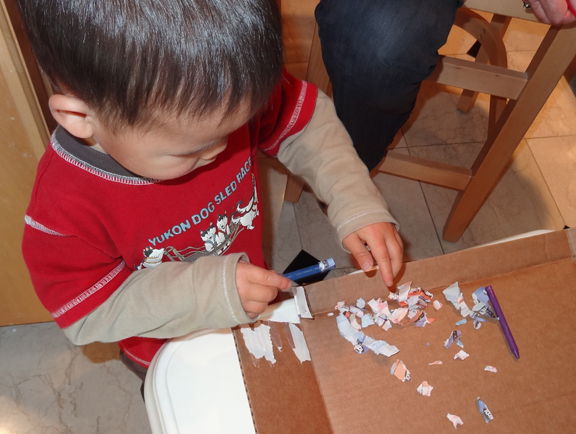 I love the fine motor exercise too! @Missy, we also did this last year and the pumpkins lasted well over a month! I love this! It looks so neat and like nothing else I’ve seen. What is the protective covering? Is it a special attachment to the dryer? Too funny they all flew off first, LOL. And I love that the kids were using fine motor skills! This is so neat! I bet the kids had a blast melting the crayons. I know my nephew would love it! 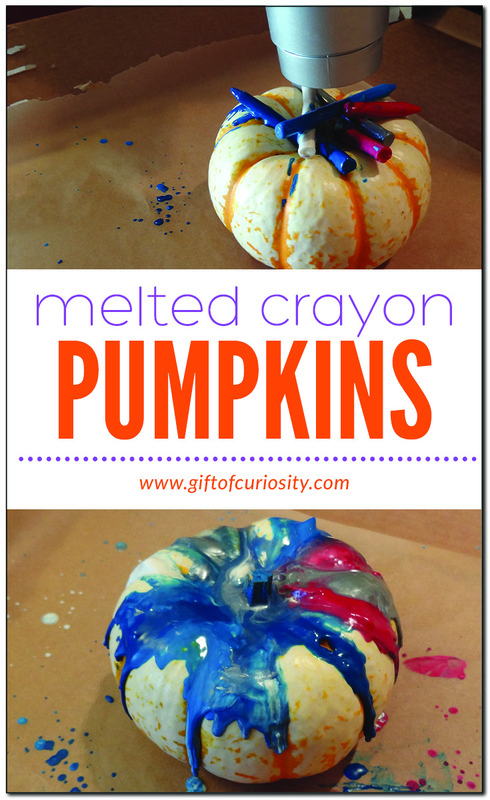 How very creative – guess this would also be a good way to use up broken crayons too. We did this last year and might again this year. 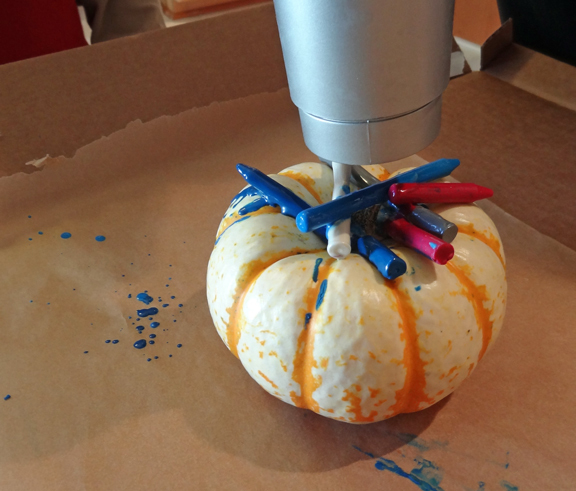 This is a fun and messy hands-on way to decorate your pumpkins. Your pumpkins turned out beautifully! Thank you for sharing and for linking up this week to the Thoughtful Spot Weekly Blog Hop. So simple and so pretty! Thanks for sharing with Afterschool! So excited to feature this as part of my ‘Share It Saturday’ collection. 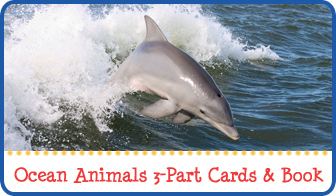 Thank you so kindly for linking up. Definitely something we need to try at our house! 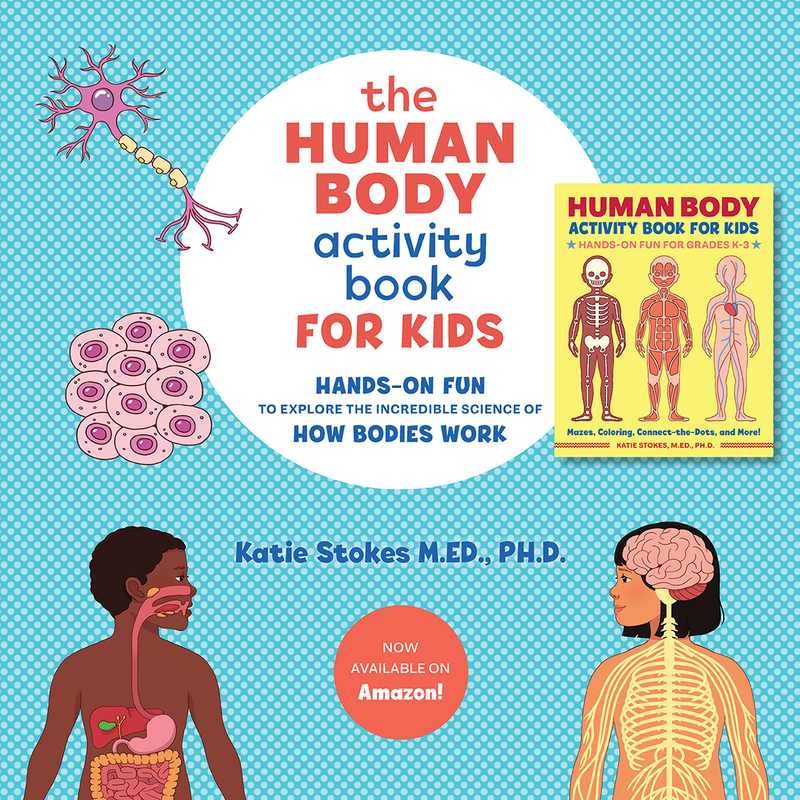 Thanks for sharing at After School – definitely something big kids would enjoy too! We are definitely going to be trying this out next week! My girls will love the melting crayons and the messiness 🙂 Thank you for sharing over at the Thoughtful Spot Weekly Blog Hop! I chose you as one of my favorites this week. 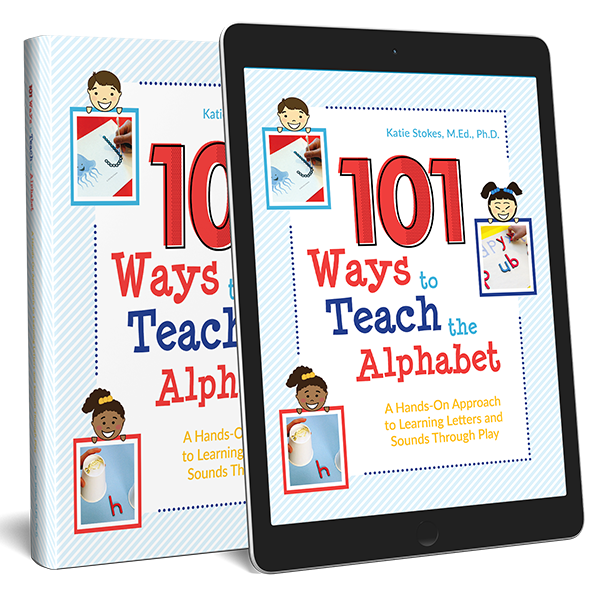 I absolutely love how well you combine fun with learning. 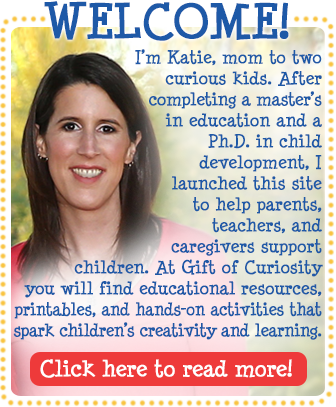 I use many of your ideas in my homeschool, with my kids grades K-2.